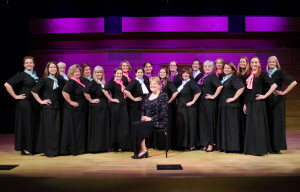 ASTER Women's Chamber Choir · ASTER wants to Grow! Artistic Director, Christina Lynn-Craig will be holding auditions throughout the Summer. No sight-reading involved, but an ability to learn music quickly and a willingness to memorize music. Experienced choral singers ages eighteen through seventy-something are encouraged to audition. If you are interested in auditioning, contact Artistic Director, Christina by e-mail at Tinaregina@aol.com or at (303) 466-2879. We rehearse Tuesday evenings from 7:15 – 9:15 PM in Broomfield. Experienced Choral Singers are invited to audition for this small (24-32) voice ensemble. All ASTER members sing on a volunteer basis! Dues are on a sliding scale from $100 to $150 per year (paid in two installments in September and January). Singers also purchase a concert dress which costs approximately $100. The audition consists of vocalization to hear the quality and range of a singer’s voice, and learning a short passage of unaccompanied music and then singing it while other parts are played or sung. No sight-reading is involved in the audition, but an ability to learn music quickly and a willingness to memorize music is an important aspect of participating in ASTER. Experienced choral singers ages eighteen through seventy-something are encouraged to audition. Individual auditions may be scheduled beginning in May and will continue throughout the summer.